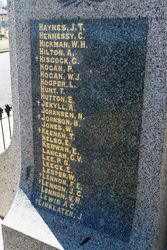 The monument commemorates those from Emmaville and surrounding districts who served in World War One. EMMAVILLE ECHOES. 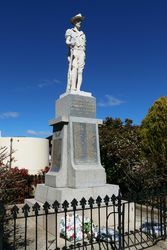 The beautiful monument has now been erected and the unveiling ceremony has been fixed for Saturday afternoon 25th inst. at 3.pm. The occasion should be one of the most memorable in the history of our town. The invited guests include Lieut- Colonel P. P. Abbott, President Ross, F. J. Thomas, Major-General Rosenthal, while the eventual unveiling will he performed Misses Lennon and Purvis, being representative of families prominent for their patriotism and the sacrifices they have made. Glen Innes Examiner (NSW), 22 January 1920. 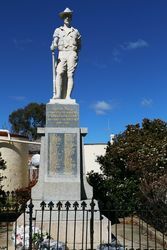 The other day a Soldier's Memorial was unveiled at Emmaville, a mining town, situated in the north, about 30 miles from Glen Innes. The population of place is about 2000 people, but they are loyal and patriotic to the core. 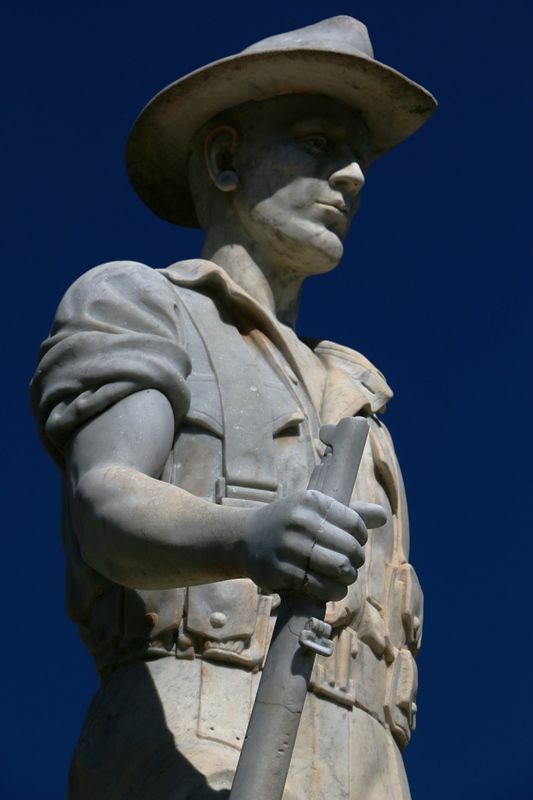 Here is a description of the magnificent memorial: — The monument, which is 14 feet in height, consists of a grey granite pedestal, set on a foundation of reinforced concrete. 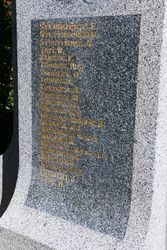 On the pedestal stands four polished tablets, on which are engraved and gold-gilded the names of 174 soldiers. A gilded cross placed opposite the name signifies that the hero rests from his labors. There are 33 of these crosses. 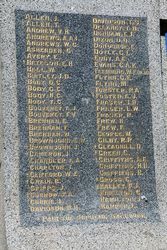 Nothing is placed on the stone to signify the rank of the soldiers, but the decorations have been inscribed. 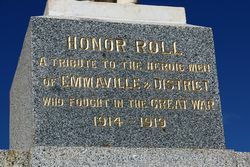 On a polished surface above the names, on the front face is the inscription, "Honor Roll a tribute to the heroic men of Emmaville and District who fought during the Great War, 1914-19." The whole is surmounted by the figure of a soldier 6ft in height. Returned soldiers who have seen the figure describe it as true to life. 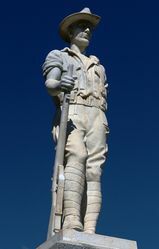 The soldier is standing at ease, preparatory to the command to "hop over." His shirt is open at the throat, his sleeves are rolled up, the expression of face tells of his mental tension, while his whole appearance bespeaks determination, the characteristics that have placed the Australian soldiers in the forefront of fighters. It is a masterly piece of work and was sculptured by an Italian sculptor from Italian white marble.